Bo was given to Tammy as a wedding present from dad, Harvey Grunden. 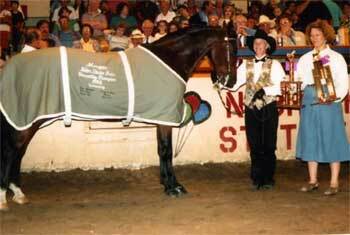 Throughout the years, Tammy has broke and trained Bo under saddle in Western and English. Tammy and Bo have successfully shown and won many High-Point and Versatility Awards at Open, Morgan, and State Fairs. Harlan took over Bo in his quest to learn how to drive. 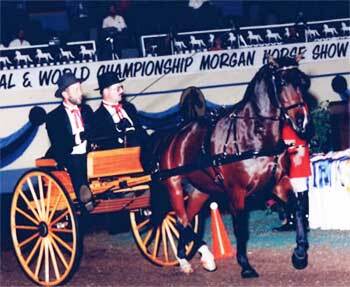 The highlight of his driving career was Reserve Champion Double Jeopardy Carriage Driving and placing in every class he was in at the Grand National Morgan Horse Show. Bo has also been our babysitter and teacher for our two children. So as you can see, Bo was Tammy’s horse but was shared by everyone. 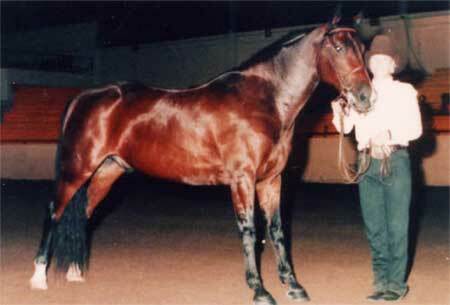 His sire is the late Rimlo Black Prince. He is enjoying retirement, but at the age of 24 he is occasionally called upon to pull a carriage for a wedding or give a youngster a ride. With all these accomplishments that Bo has achieved, we want to THANK-YOU Dad for this wonderful wedding gift.